Pasta for breakfast, yes, please! 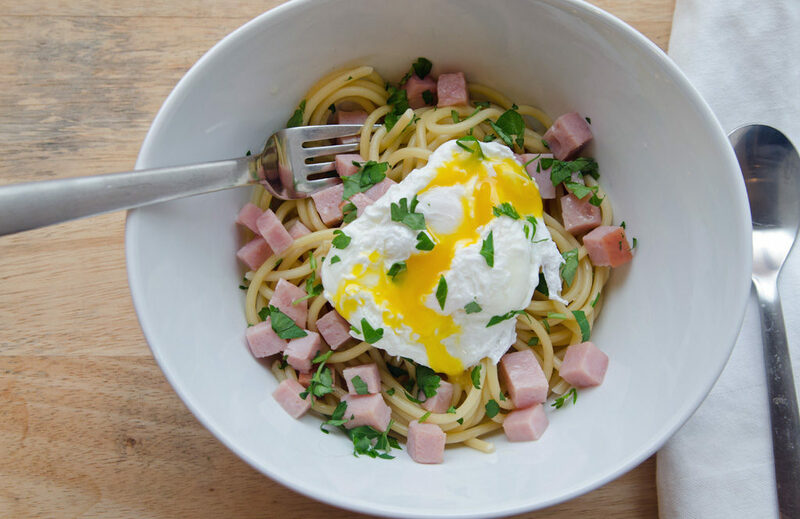 This breakfast bucatini is fast, delicious and luxurious. It’s so good you might want to have breakfast for dinner. I am officially obsessed with this recipe – Breakfast Bucatini. It is actually my favorite recipe that I have developed and cooked thus far in 2017. This dish is simple to make yet luxurious eat. 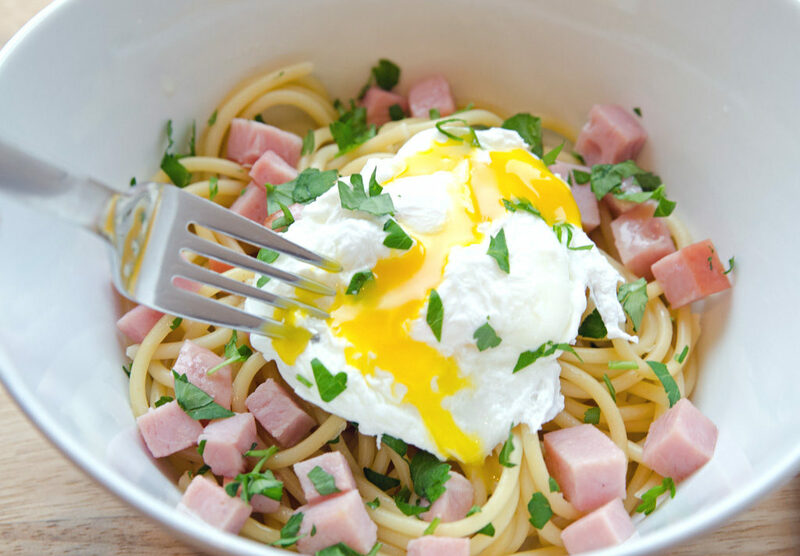 Toothy al dente pasta, salty ham, and a runny egg…it’s breakfast perfection. Let’s face it, calling this breakfast food is a bit of a misstatement. It’s definitely a hearty start to any morning but, it can also be eaten for lunch or dinner. Personally, I think this dish is perfect for brunch. I have a friend who does not understand the concept of brunch. Hybrid meals are not in her DNA. But, I think this dish might convert her into a brunch lover. Runners also take note: if you are carb loading this dish is an excellent choice with a good dose of protein too. 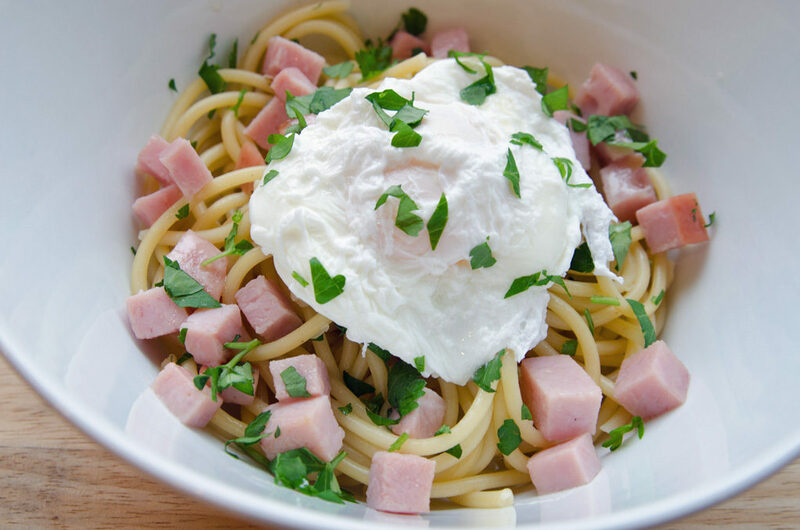 What is so fantastic about this breakfast bucatini is how few ingredients are needed to prepare the dish. Technically you can use any pasta but I love bucatini. Bucatini is thick spaghetti with a hole running through the center. Slurping this pasta is fun and I love how a little bit of the sauce gets in the hole of the pasta. If you want to add more fiber to the dish, I recommend using a whole wheat pasta. Pasta for breakfast, yes, please! 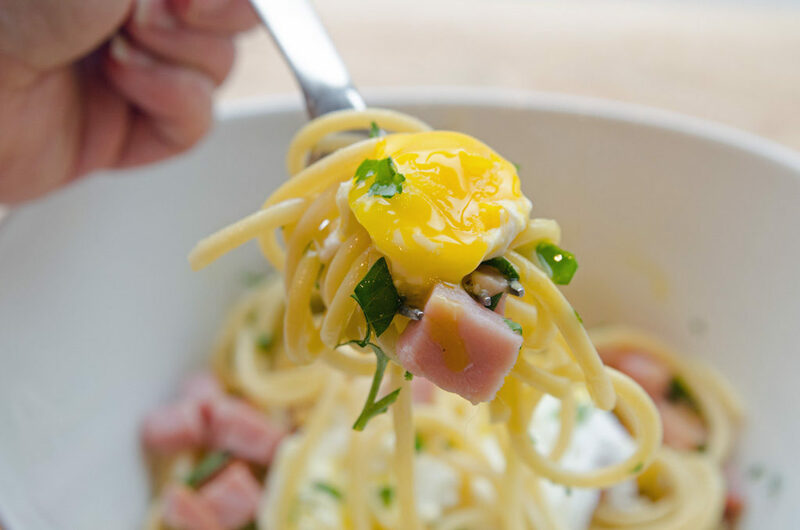 This breakfast bucatini is fast, delicious and luxurious. It's so good you might want to have breakfast for dinner. Bring a large pot of water to a boil then turn heat to low and simmer. Add a small dash of vinegar into the pot. Crack eggs individually into a cup. This is important! Unless you are a pro, the next few steps are tricky. Create a swirl of water in the pot by stirring the water in a circular motion using a wooden spoon. Then, gently add an egg. Add the egg white first then, add the yolk. Remove egg with a slotted spoon and place on a paper towel. Dry off any moisture, gently. Cut away any straggly egg white edges with a spoon or butter knife. 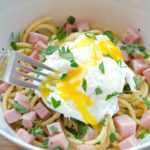 Serious Eats has a great tutorial/ post on how to make poached eggs. Add the pasta and cook until al dente, about 8-10 minutes. Drain the pasta and reserve 1/4 cup of the pasta water. Add the ham and cook until the edges are bit crispy. Add the pasta water. Stir until combined with butter. Add the pasta and parsley, reserving a few pinches of parsley for garnish. 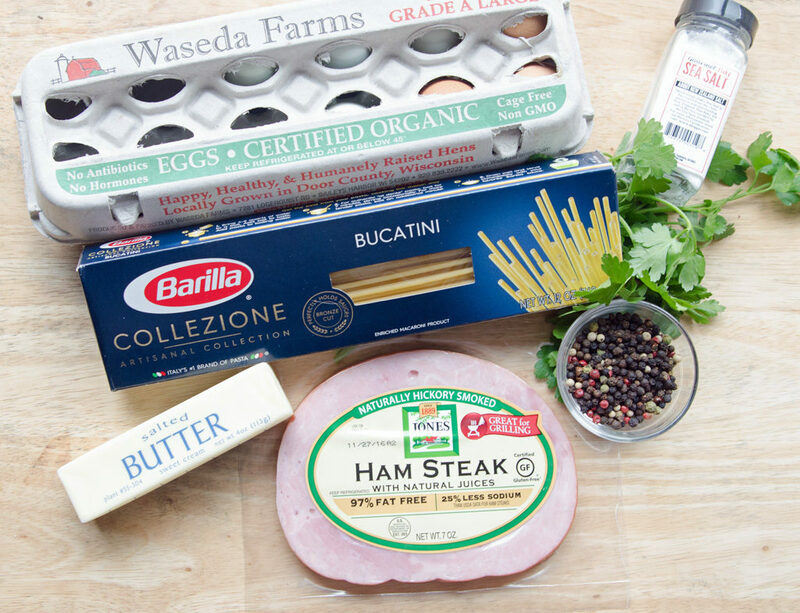 Toss pasta until the pasta is coated with butter sauce and ham is evenly distributed. 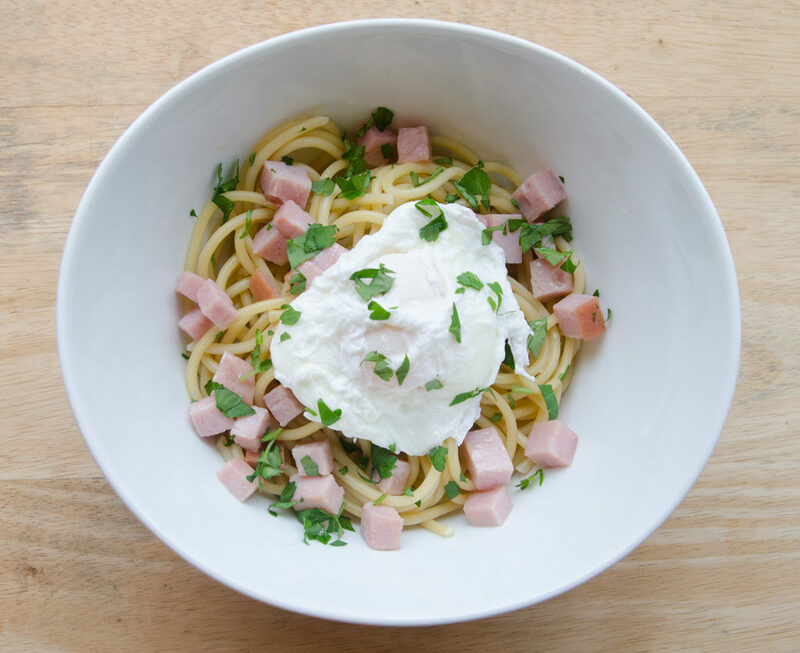 Divide pasta into 6 serving and top with one poached egg and a pinch of parsley. You can substitute a sunny side up fried egg for the poached egg. The hardest part of making this dish is making a poached egg. If you’re in a pinch for time, substitute a fried sunny side up egg. You will still get the velvety yolk which is key to making this making this dish come together. This looks like my next favorite breakfast for dinner recipe! Thanks! I could eat this for breakfast. It sounds delicious.